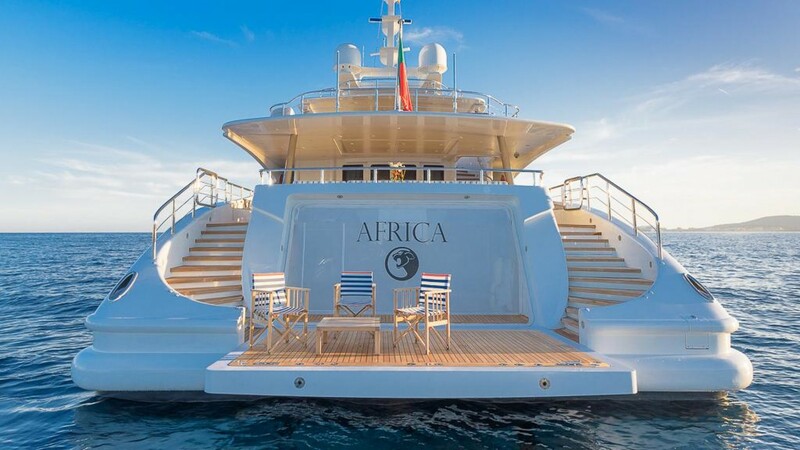 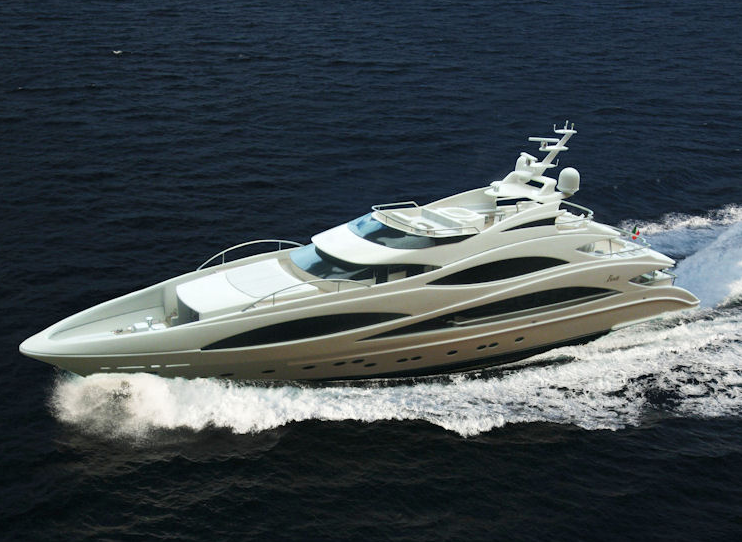 The motor yacht AFRICA I was launched in 2010 by one of the world leaders in shipbuilding, the Italian Benetti shipyard. 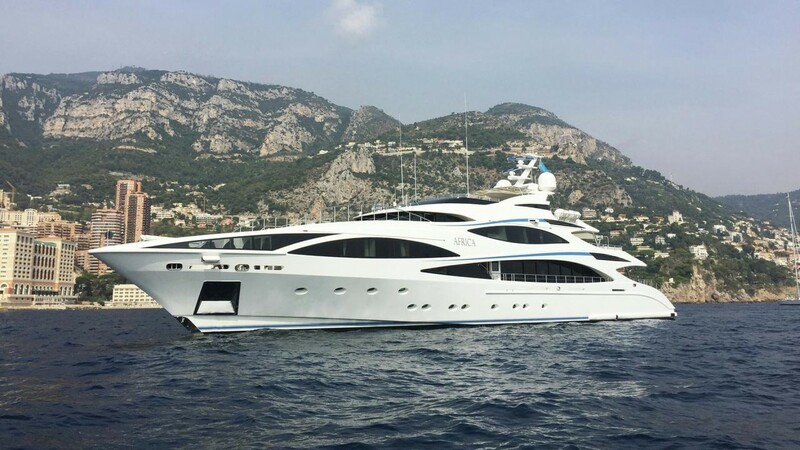 The yacht is 47 metres (154.20ft) in length overall, with a beam of 8.8 metres and accommodation for up to 12 charter guests, in 6 cabins. 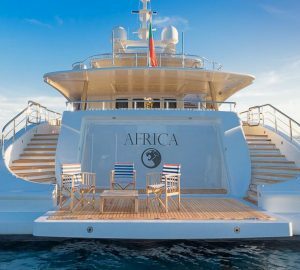 This sleek and contemporary, beautiful AFRICA I motor yacht was designed by Stefano Natucci with the interior design by Francois Zuretti. 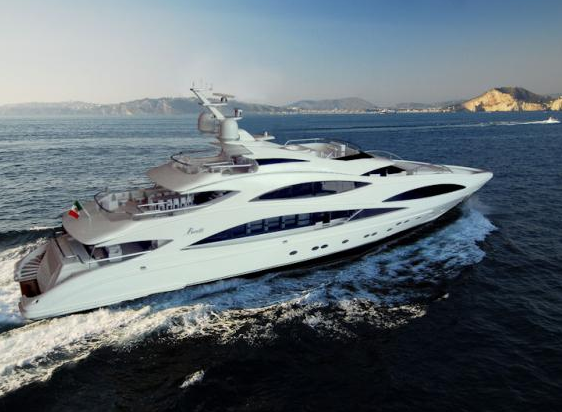 The hull FB 50 is a full aluminium semi-displacement mega yacht, which was constructed at the Benetti Pisa Superyachts Shipyard. 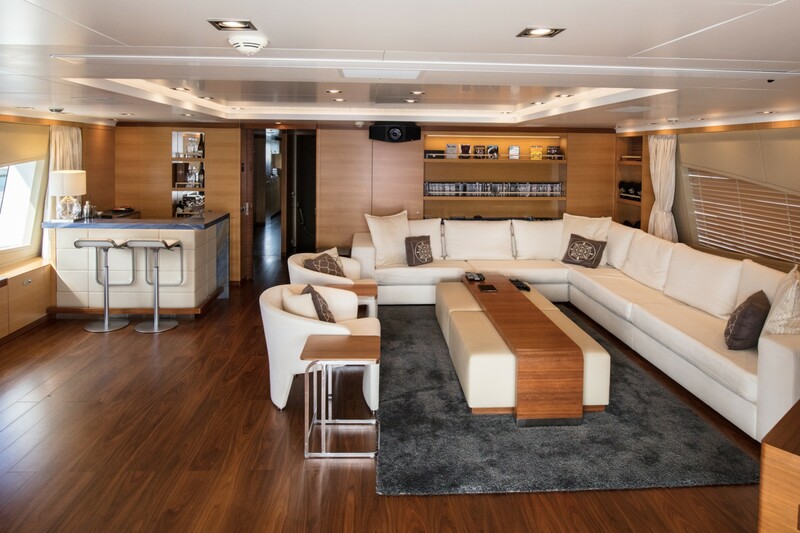 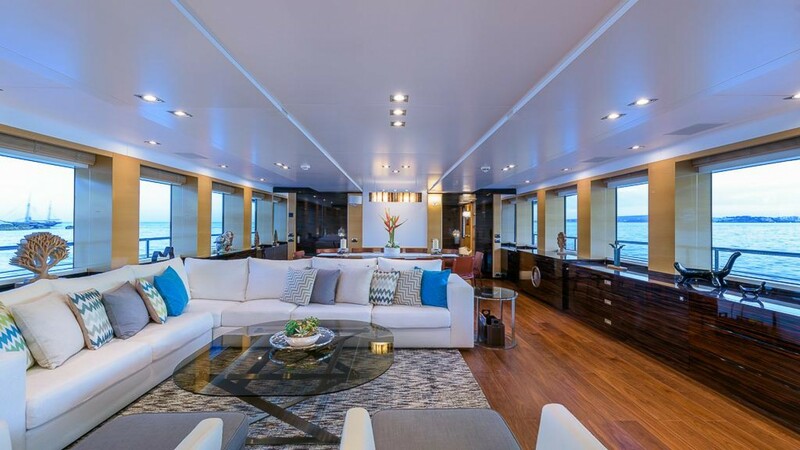 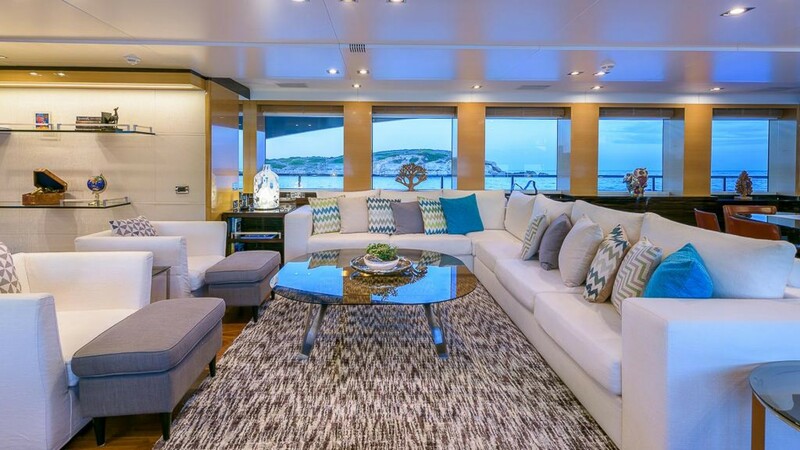 Her interiors are bright and well-appointed, with the main salon set in an open plan with the formal dining on the main deck, plus a spacious skylounge on the upper deck. 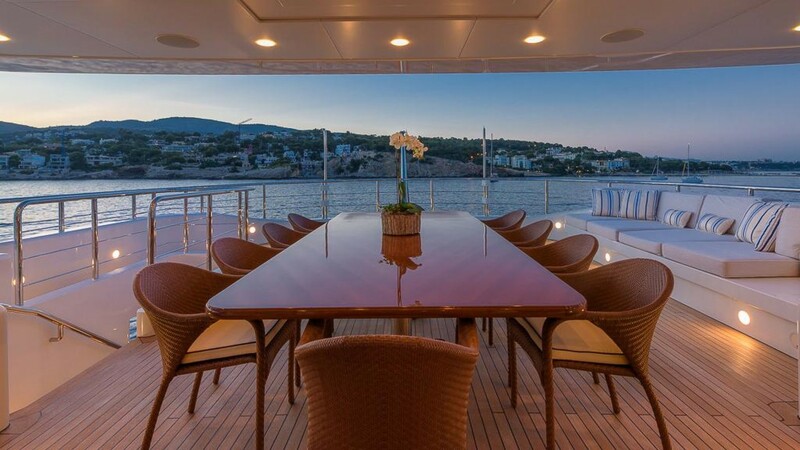 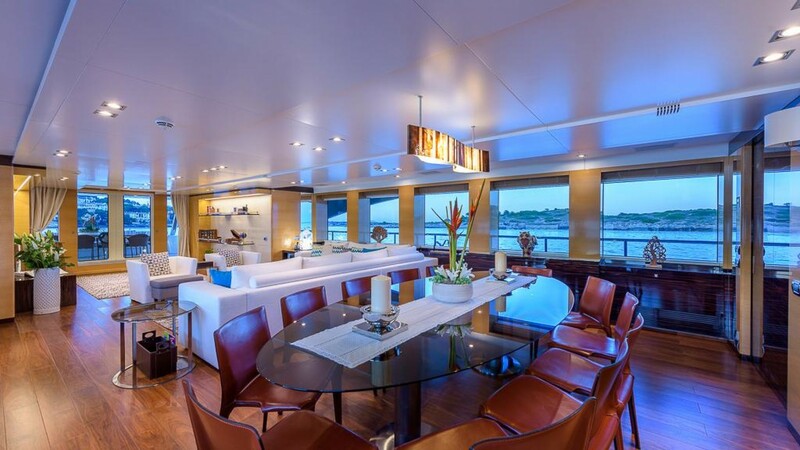 Both decks are surrounded by panoramic windows, offering fabulous views. 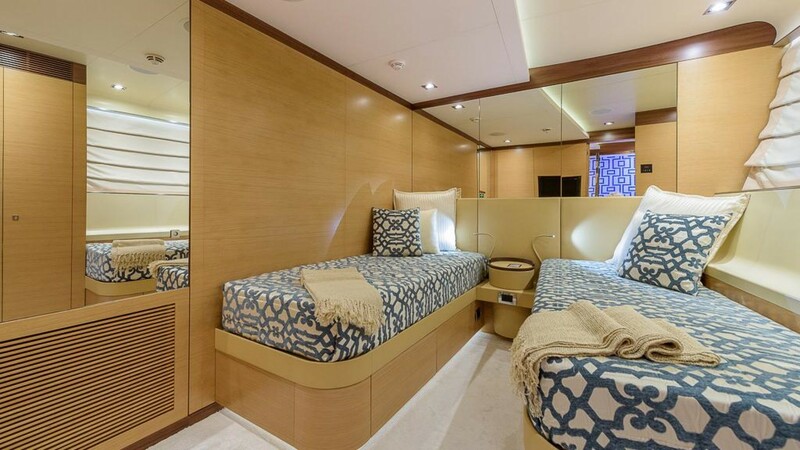 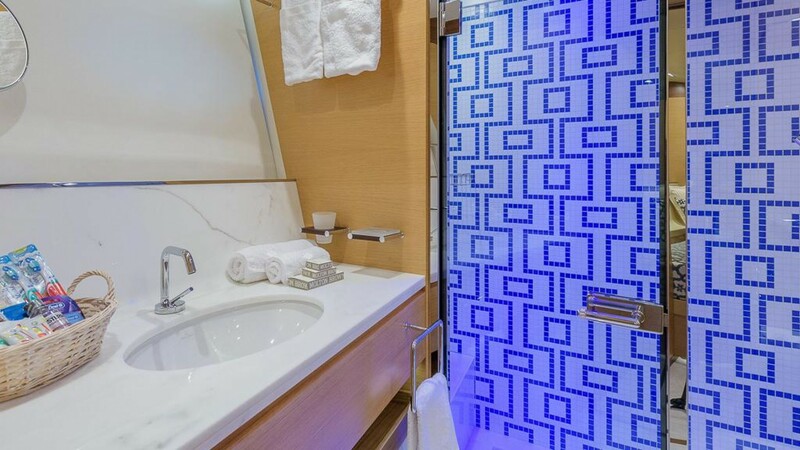 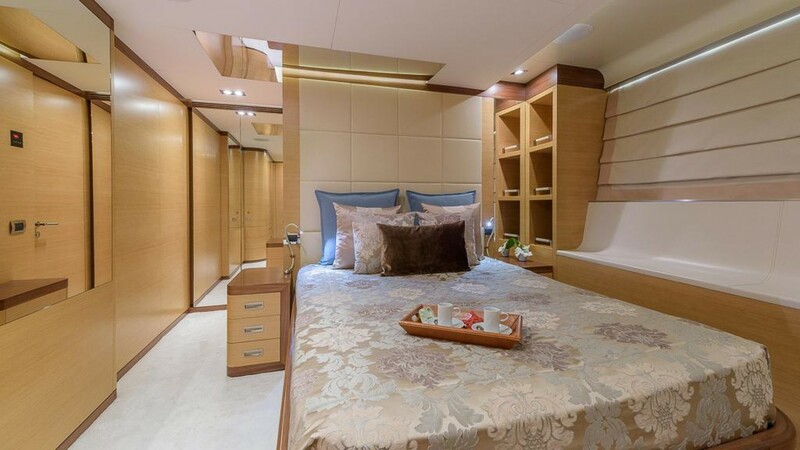 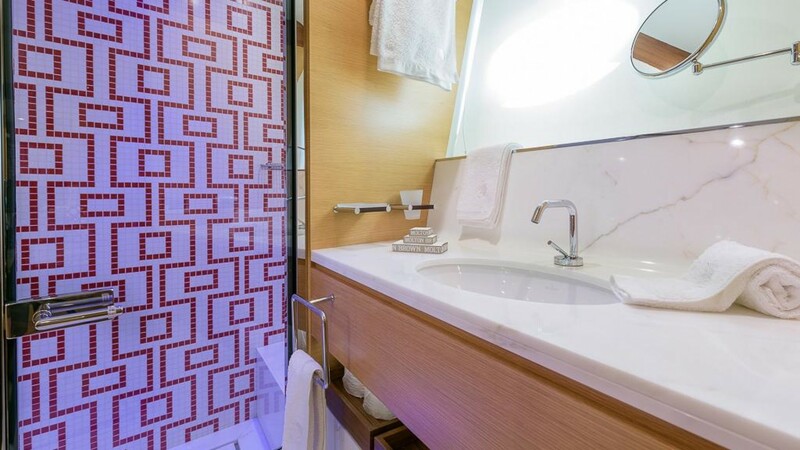 The master stateroom is on the main deck forward and boasts a forward facing view and private exterior space. 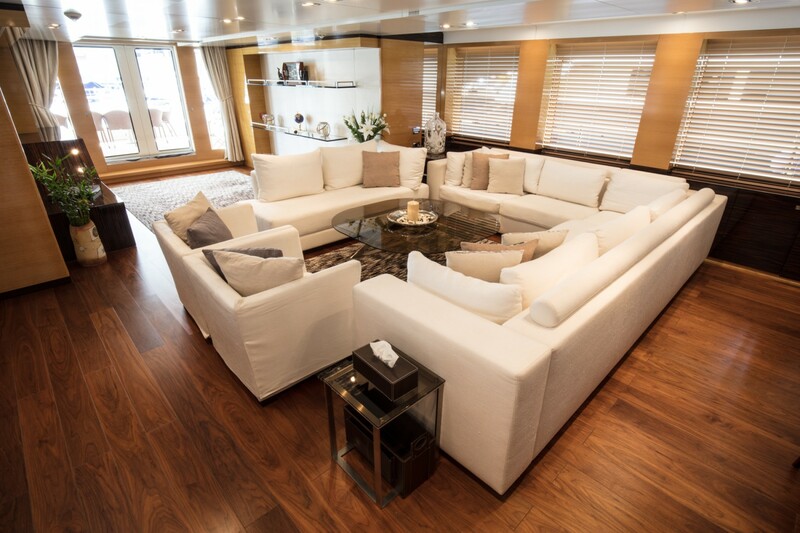 The Benetti yachts exterior living is laid over 3 decks and is ideal for the ultimate in relaxation or entertaining in style. 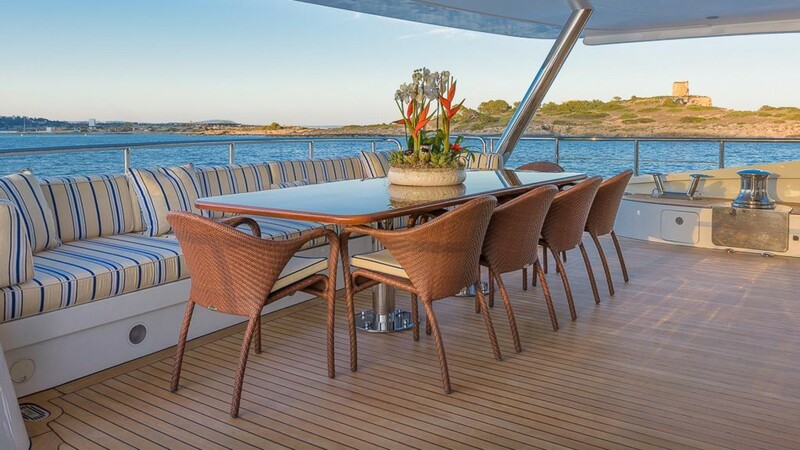 An aft deck is shaded and offers an alfresco dining table and direct access to the lower swim platform. 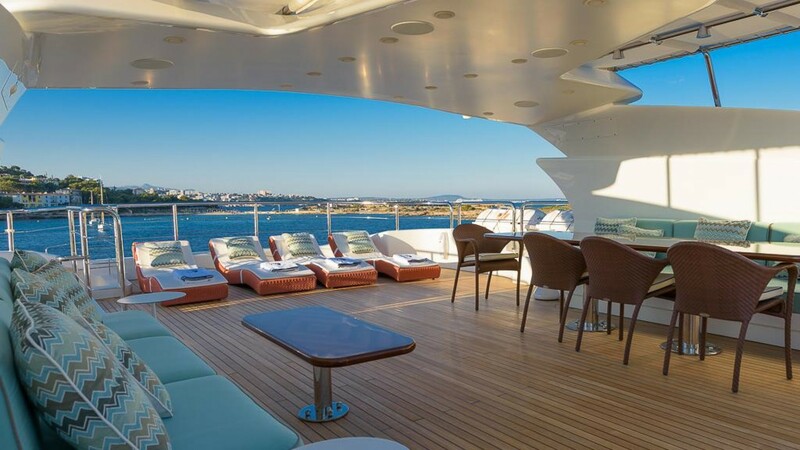 On the upper deck, are an additional alfresco option and sunpads. 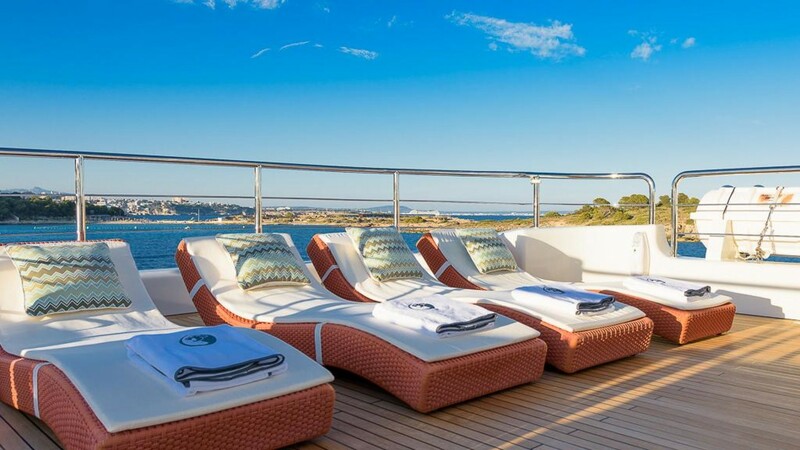 The sundeck is perfect for any venue, complete with a Jacuzzi, sunpads, alfresco dining, chaise loungers and partial shade. 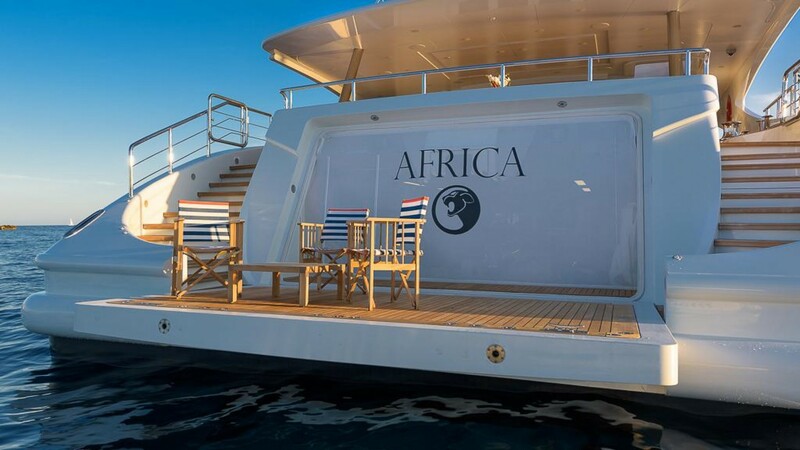 AFRICA I is powered by twin MTU M90 16V 4000 engines, she has cruising speeds of 12 knots and top speeds of 24.2 knots. 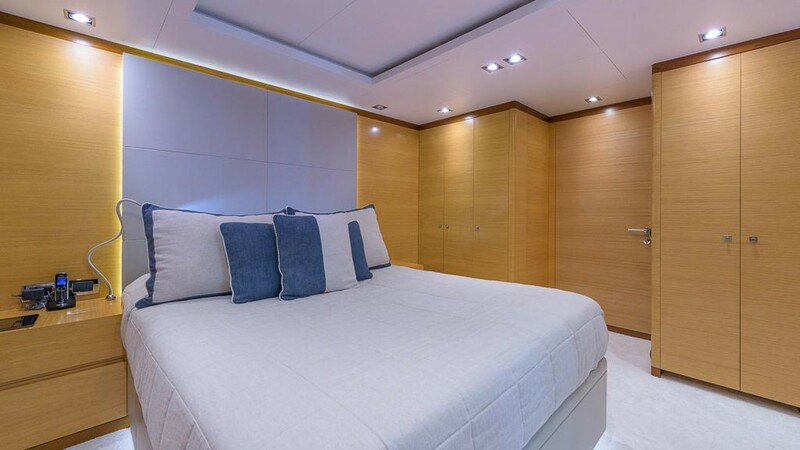 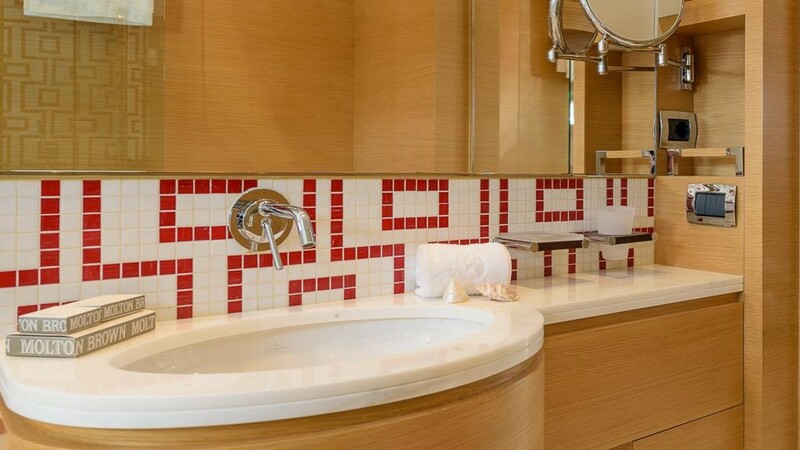 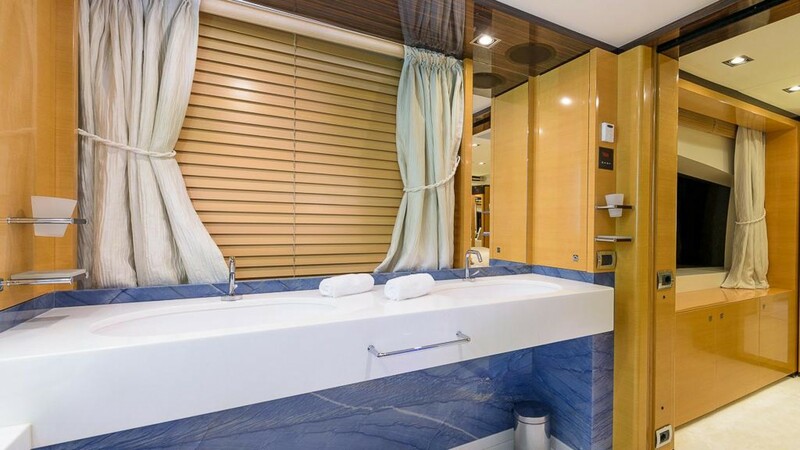 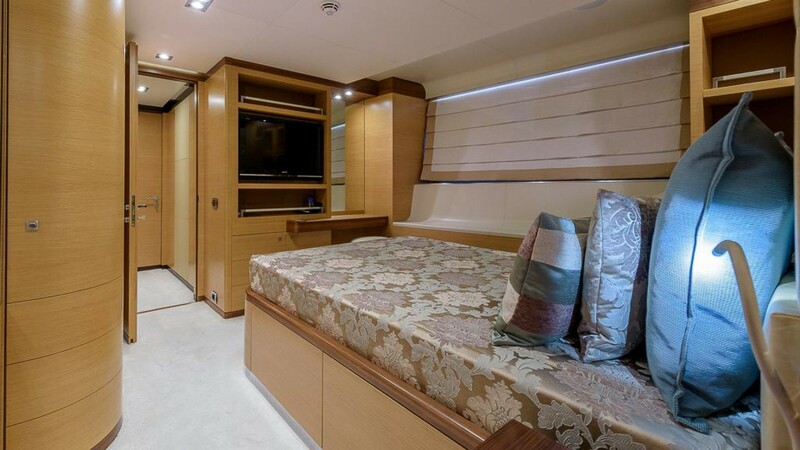 Accommodation is provided in 6 well-appointed cabins, comprising a master on the main deck forward and full beam of the yacht, with private deck space. 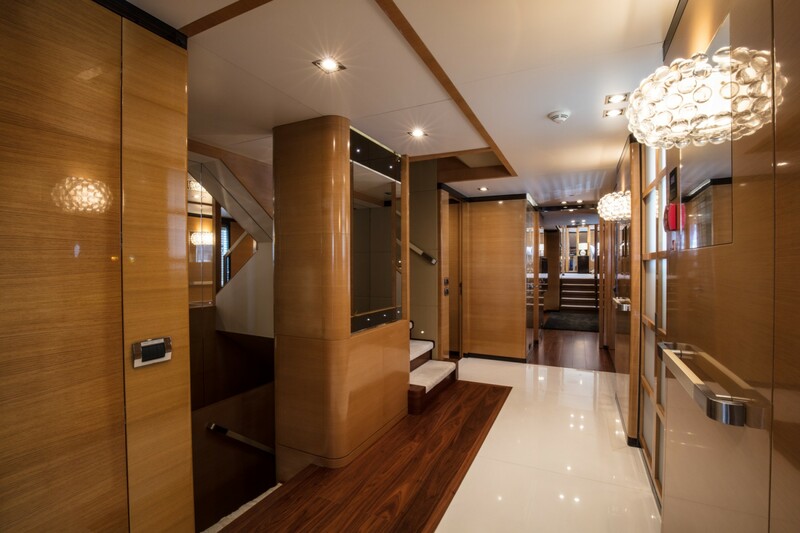 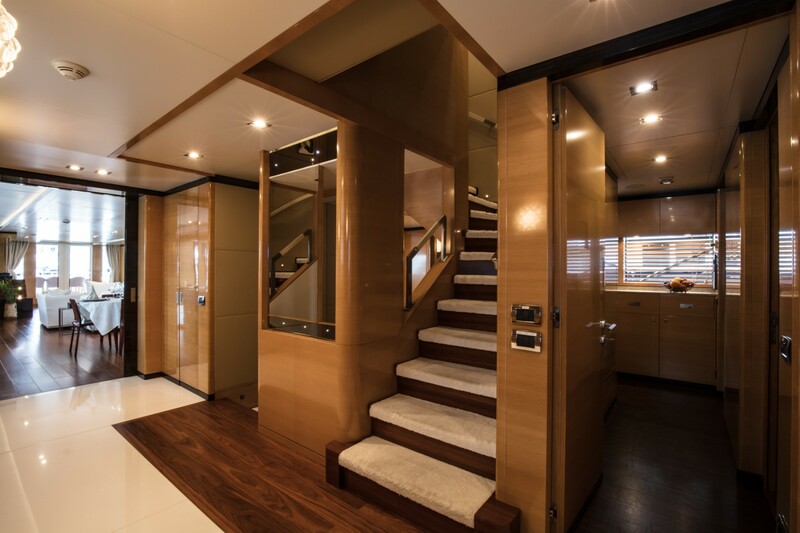 On the lower deck are a further 3 double and one twin cabin. 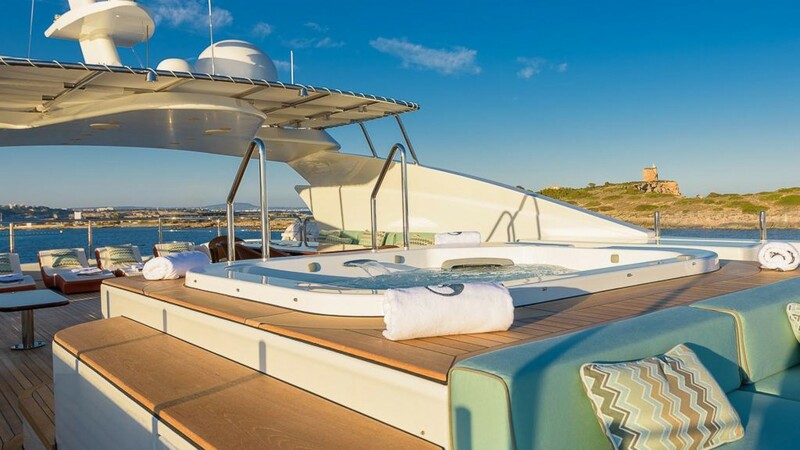 Scorpion 7,5m chase tender 2 x Seadoo RXP-X RS 300 waverunners (2018) 1 x Seadoo 260 HP (2018) 2 x Seabob F5S (2018) Paddle boards (2018) Water skis Wakeboard Inflatable towables Giant slide (2018) Floating inflatable pad, with waverunner docking (2018) Snorkeling equipment Fishing tackle Audio Visual Equipment and Deck Facilities: Throughout the yacht, guests will be able to enjoy Satellite TV channels, a wide range of movies, music and 3G/4G Internet. 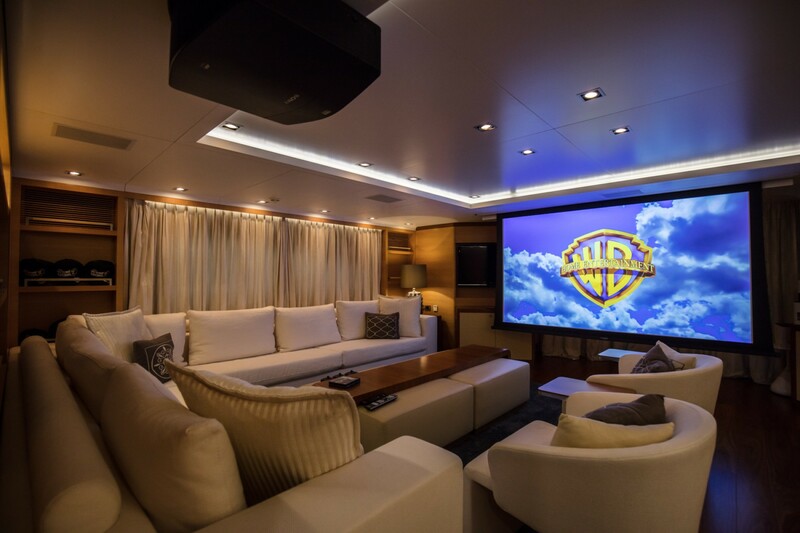 Main salon: LG ~50" 4k TV Denon Amplifier, 7.1 B&W speakers with B&W subwoofer Oppo Blu-ray disc player Upper salon: 106" Screen with latest Sony Ultra HD 4K Laser projector (VPL-VW760ES) Marantz SR8012 Amplifier, 5.1 B&W speakers with JL-Audio Fathom 113 subwoofer Oppo 203 Blu-ray disc player for 4k HDR blu-rays Xbox one X enhanced for gaming Sony ~46 for use when the big screen is not in use Guest Cabins and VIP: ChromeCast (video and audio streaming from users own devices) TVs are about 32" - 50", not sure of the exact measure. 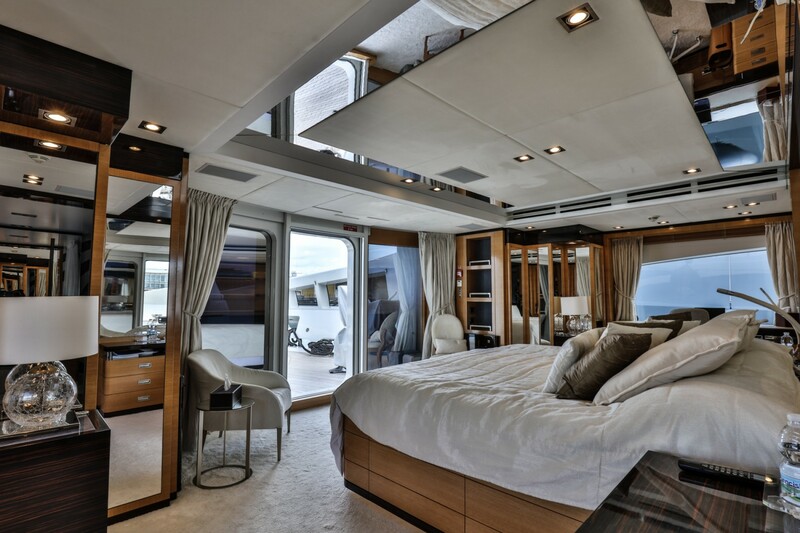 Denon amplifiers and B&W speakers Sony / Denon Blu-ray disc player Master Cabin: ChromeCast (video and audio streaming from users own devices) PlayStation 4 for gaming and bluray movies Denon Amplifier, B&W speakers + B&W subwoofer In addition outside areas and salons (main-deck salon, Upper salon, main-deck aft, upper aft and sundeck) are individually controlled via HEOS multi-room system. 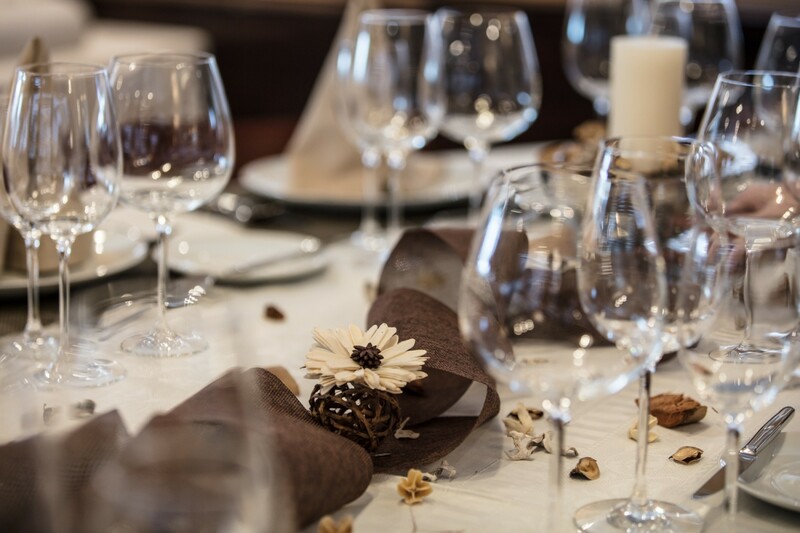 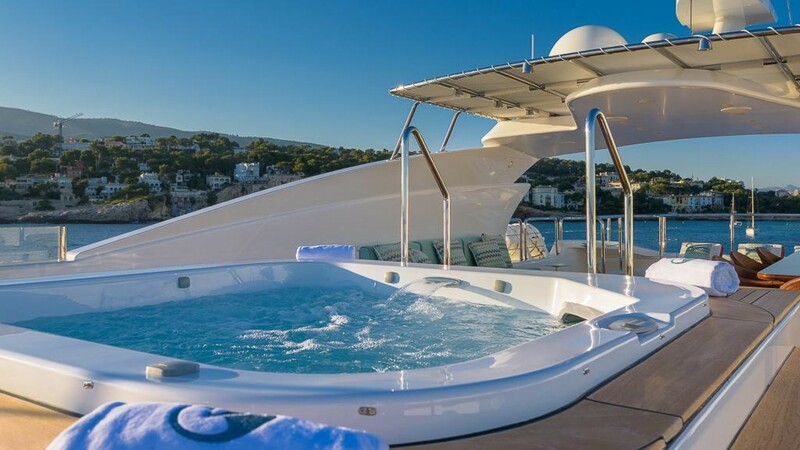 The system can be used with the iPads in the yacht or by the users own devices when connected to the wireless network of the Yacht. 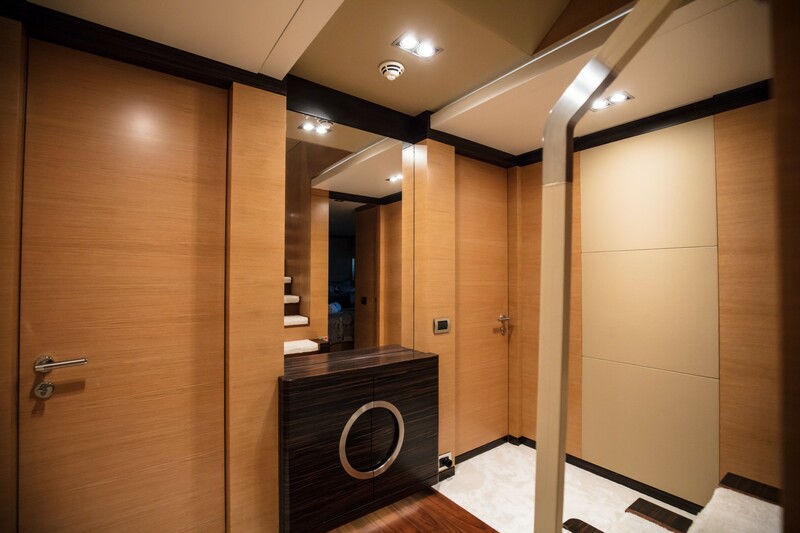 There is also a media server for video and sound playback when Internet connection is not available, and an impressive collection of Blu-ray movies. 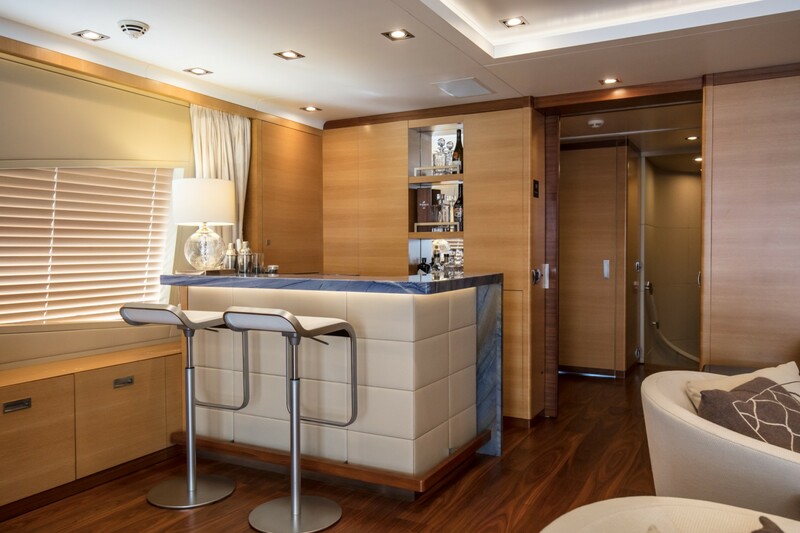 Communications: 3G/4G wireless internet via wifi when cruising in EU countries Gym equipment: Stationary bike in master private foredeck.